The proper labeling of arc flash hazards is vital. By labeling your facility you can help prevent accidents related to arc flash, as well as other electrical accidents. These accidents are more easily prevented when employees are aware of arc flash risks and dangers in their environment. 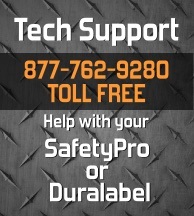 The SafetyPro arc flash label printer works with industry standard arc flash calculators and arc flash software. Use one of the most trusted names in the industry: SKM PowerTools and SKM ArcCalc arc flash calculator. With SKM ArcCalc you can accurately map your simple system and print arc flash labels on the fly. SKM PowerTools are also used by electrical engineering firms to generate computerized maps of your complex systems. With SKM's full range of product offerings, you are sure to find arc flash analysis and arc flash calculation software that meets your needs.